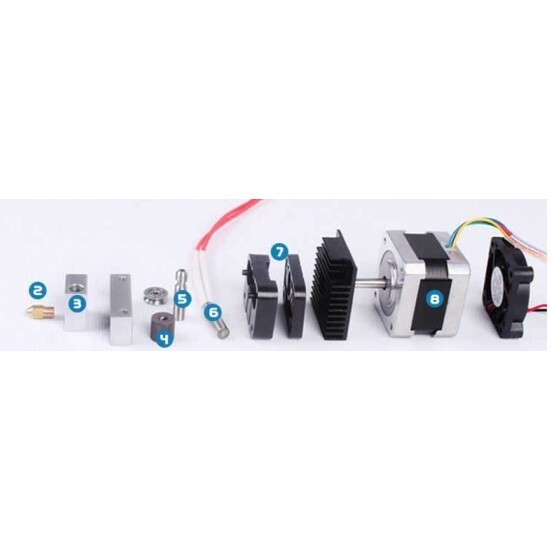 The 3D Printer Extruder Kit is the most important component for 3D printer. The extruder is responsible of delivering the plastic material in smooth, continuous way at certain flow rate. The Key to printing resolution is mostly depending on the Extruder. Based on MK8 extruder, this is upgraded third generations extruders. It is fully assembled with stepper motor. Extrusion Nozzle: Super-fine CNC machined nozzle with more clearer nozzle wall of 0.2 mm hole permits more precise filament extruding without jamming. Heating block: Fine machined aluminum heating block ensures better assembly and quality. Drive Gear: Traditional filament drive gear cannot provide sufficient clamping strength. once the filament get uneven, the gear is jammed, no matter the filament is too thin or too thick. With the new MK8 drive gear with sharper teeth and bearing support, almost all filament can get through without jamming. Hot End Threaded Tube: This hot end threaded pipe connect the filament to injection nozzle. The filament melt in this pipe and change from solid condition to liquid condition. Stepper Motor: High quality stepper motor NEMA17, 5mm Shaft with precision threaded ACME rod.